When I started blogging back in 2009 this was one of the most hyped about nail polishes along with Gosh Holographic which I also own. I managed to get both on blog sales, why they were being sold for such cheap prices in the first place I have no idea but I’m so glad I have them. Over the years I have managed to find very close dupes to Rainbow but nothing beats the original. I’ll be sharing these on the blog over the next month or so if anyone is interested. Rainbow is a layering polish and although it looks good with other colours, both light and dark, it looks amazing over black. It’s one of those polishes that looks so much better than any photograph will show and I’ve done my best. Depending on the light, it changes between red, orange, gold and green which is down to the flakie glitter. It’s also pretty easy to remove unlike traditional glitters. I really need to start wearing this nail polish more often! The only downside, Gosh don’t sell this anymore and unless you’re lucky like me and find it in a blog sale then it’s trailing through Ebay in the hopes of finding one. 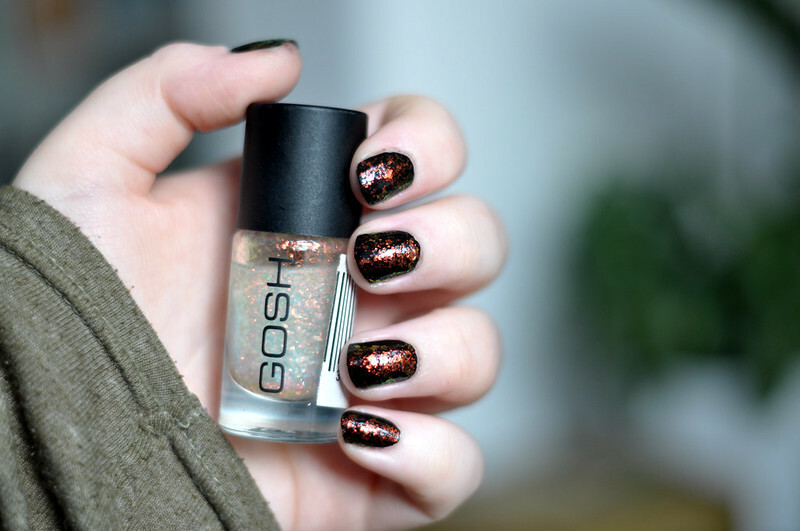 This is so pretty, I don't tend to wear glitter cos it's so hard to remove so its good to hear that this is not. I am definitely going to pick this one up. Oh my, what an amazing looking polish. Need to look if I can hunt it down somewhere!